Ascension at The Throne of Games – Long live the King! As formerly noted, one of the secrets of the gaming industry, comparable to “The Emperor has no clothes!”, is that the former King of roleplaying games, Wizards of the Coast’s Dungeons and Dragons, was deposed from, or more abdicated from the Throne of Games and dropped out of the top five roleplaying games. 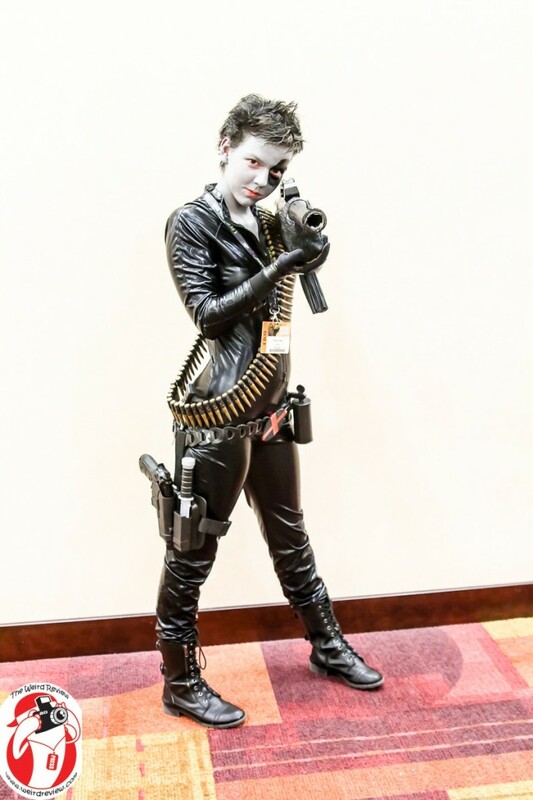 The gaming mega-con, GenCon 2014, was held August 14 through 17 and it was clear there was no vaccuum of power left in their absence at the ENnie Awards. Evil Hat Productions, publishers of the Fate Core System, ranking #4 in ICv2’s top five role playing games, received eight ENnie awards at GenCon, including the Silver award for Best Publisher. Monte Cook Games, LLC, Numenera ranked number five of the ICv2’s top five role playing games and took nine ENnie awards including the gold for Product of the Year. Monte Cook formerly worked on Wizards of the Coast’s on their newly released version of their dungeons and dragons genre game, “Next” but left due to differences of oppinion with the company. 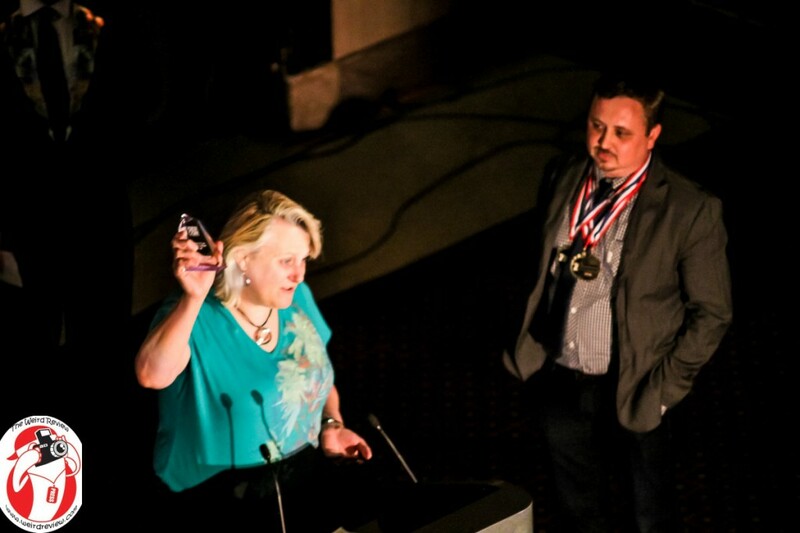 From this year’s ENnie awards it is clear that Evil Hat Productions and Monte Cook Games have truly risen to the level of Lords of Gaming but who has risen to the top? The Paizo Publishing Company‘s Pathfinder ranked number one on the ICv2 list of the top five role playing games and at the GenCon Ennies their pathfinder products took eight ENnies for Paizo as well as two for Whiz Kids for their Pathfinder miniatures. Among their eight awards, all gold, was the gold award for the Best Publisher. So, while Hasbro’s Wizards of the Coast failed to produce anything worthy of a nomination by the dungeons and dragons playing community at GenCon’s 2014 ENnie awards, Paizo’s Pathfinder has clearly risen to claim the throne with Monte Cook Games, LLC and Evil Hat Productions at their sides. While Hasbro’s Wizards of the Coast struggles to keep their brand alive, the dungeons and dragons genre thrives on without them. So, in the meantime, if your kids say they are playing dungeons and dragons, chances are high that it is Pathfinder from Paizo. The King is dead! Long live King Paizo! 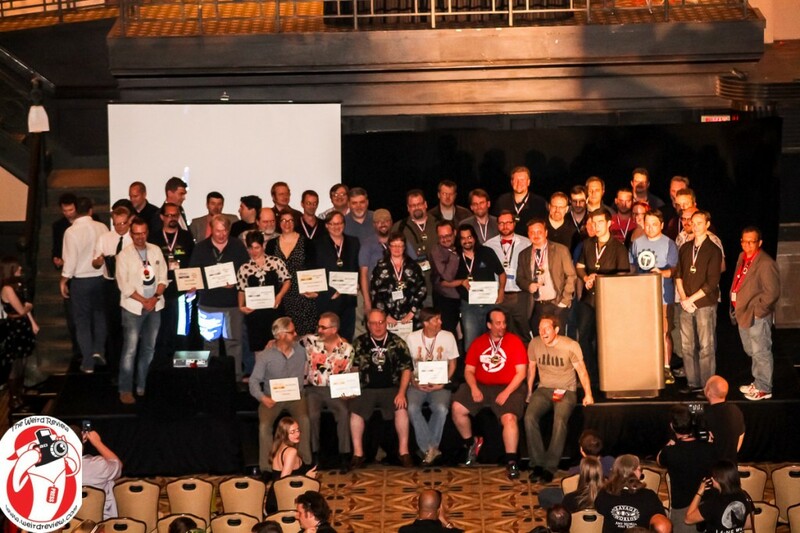 Winners of the Ennies at GenCon 2014 – Can you find Wizards of the Coast? Nobody could. 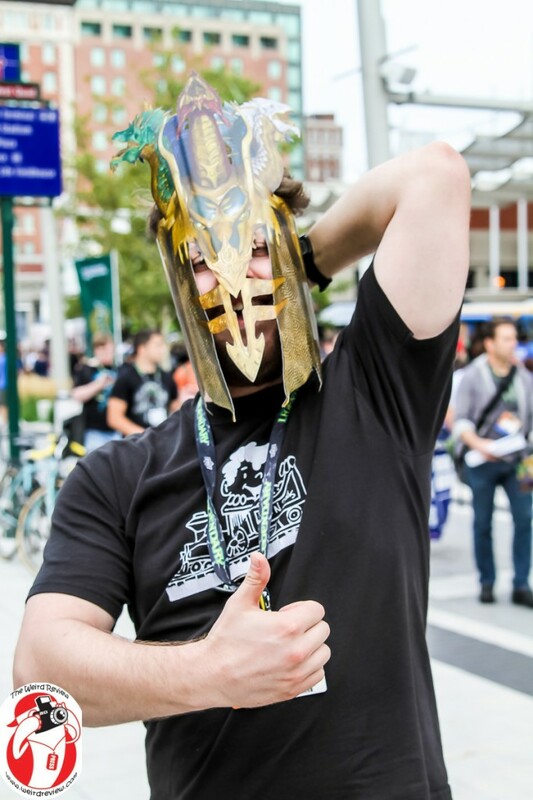 On Friday August 15, 2014 at GenCon in Indianapolis, Indiana the Wizards of the Coast held a party to mark the launch of Tyranny of Dragons for their latest release of their dungeons and dragons genre role playing game. Wizards of the Coast are copyright owners of the original Dungeons and Dragons roleplaying game, once the undisputed king of role playing games. Now the Wizards of the Coast roleplaying division doesn’t even make the list of the top five role playing games. The Wizards held their launch party under a tent on Georgia Street where the food vending trucks were selling their wares. As far as parties go it was more lively than a typical wake but less celebrative than a New Orleans funeral procession. They had distorted music blaring on substandard speakers and it was difficult, at best, to enter the tent without earplugs. The exciting gift for those attending was a cardboard face mask. While most of the folks on the street were there for the food trucks, the attendees of the party were kept moving as they looked at the few cases of items on display, much like an open casket viewing. 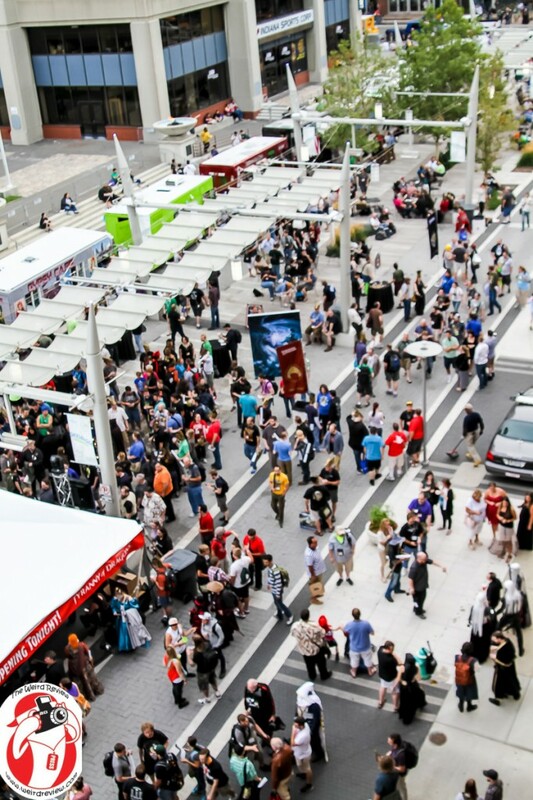 A few members of the press were on the fringes of the tent discussing how much Wizards of the Coast had dropped the ball in terms of marketing and, indeed production of quality gaming. In 2012 they put on an extravaganza that impressed all who attended even though it was all smoke and mirrors with no substance and was followed by problems and delays in producing a replacement for the much maligned fourth edition. This year at GenCon 2014, Wizards of the Coast doesn’t even have a booth in the Exhibition hall. As far as the demonstration gaming, Michael Tresca, veteran gamer, respected game reviewer, and National RPG Examiner commented that he had played one of their adventures and experienced TPK, total party kill. Even though the players had played intelligently, they were slaughtered without mercy. This is not what one might expect from a company that is trying to gain new players for their system. After paying appropriate respect to the Wizards of the Coast the next stop for the evening was the Ennie Awards. While it was no surprise that Wizards of the Coast didn’t take any Gold or Silver awards, it was a bit of a surprise that they didn’t even place in the top five in any Ennie category. The Wizards’ “party” had already disbanded and the displays were being packed up after the Ennies had ended. Will 2014 truly mark the end of Dungeons and Dragons as a viable brand as the dungeons and dragons genre continues to expand with Paizo’s Pathfinder, Monte Cook’s Numenera, Evil Hat’s Fate Core System, and others? Will Hasbro’s Wizards of the Coast pull a true resurection or are they just pumping good dollars after bad and doomed to earn the titles of Hasbeens and Withereds of the Coast? While only time will tell as it is not yet a total flatline, the future looks pretty grim for the brand. Speculation has already begun on who will next own the Dungeons and Dragons name when Hasbro pulls the plug.